Your trading computer setup can often be drastically changed by upgrading your accessories. 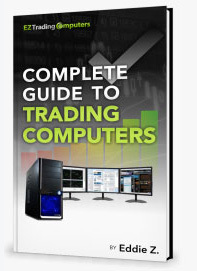 If your like me, your trading computer workstation comfort and efficiency is super important. I’ve used multi monitor arrays for years. Honestly, I can’t imagine getting anything done with out them. Well, I suppose I could still trade, but it wouldn’t be nearly as efficient. I often have 8-10 or more application windows open at a time. Multiple monitors allow me to view all of those windows at once. I can arrange them however suits my work the best. I’m able to focus on one full screen application window or divide my screen into two application windows (split screen) and still have other monitors to have charts, Skype, and more open. I get asked about the usefulness of multiple monitors often. Usually the question I’m asked, “Is it worth it?” My answer is always the same. With out a doubt – YES. Using a single monitor for trading is like using dial up for your internet. It’s an option – but it doesn’t even compare in how it can elevate your trading. Trust me on this one. I have a quad monitor setup using the stand above. I use the two upper monitors as my main monitors while I am standing and working. They can articulate upwards so I just adjust the tilt when I want to use my standing workstation. Then, I use the adjustable desktop standing desk to have an elevated work surface for my keyboard and mouse. It’s collapsible, so I just store it under or next to my trading desk. I grab it, unfold it, and place it right on my desk. All i have to do is place my keyboard and mouse on the standing work area – and I am good to go. It’s a really nice option if you ever feel body fatigue during the day because you are sitting for so long. It’s actually improved my productivity because when I get uncomfortable I just switch to this setup. Takes me less than a minute. This isn’t a cheap upgrade. However, I think it’s been worth it. This chair is super comfortable. I’ve had mine for several years and it’s still going strong. So, it may not be a cheap upgrade but, it’s long lasting. I first heard about this desk chair from a fellow trader. He was raving about how comfortable it was and that he had less issues from sitting all day. I still find it necessary to take breaks to get up and walk around and then, at some point in the day, use my standing desk. But, I will say for the amount of time I spend sitting in front of my desk monitoring the markets and managing my businesses – this has been a great investment. This is a hardware upgrade and an accessory upgrade at the same time. I’m located in Florida and my area is notorious for short outages in our electricity supply. I used to get super stressed out because of these events, until I bought a battery backup. This thing bridges the gap until the power comes back on. It gives me 15 or so minutes to see if the power comes back on – which it usually does – or power my workstation down and save what I was working on. If you live in an area similar to mine, you should consider adding this to your trading computer setup. It’s saved me from a major disaster more than once. You can totally eliminate downtime caused by a power blip by using a battery backup. This upgrade doesn’t cost you a penny. Often, traders overlook calibration as an important step in setting up your workstation monitors. It’s important to make sure that your monitor’s colors and black levels are set correctly. Your computer has a few simple tests you can do to make sure this is all aligned. This process can make a huge difference in the visual quality of your screens. You can find this adjustment in your screen resolution settings on your computer in the advanced settings. You will go through a few short steps and make small adjustments to your screen’s color and black levels using your monitors adjustment buttons on the monitor itself. A quick google search on windows monitor calibration will provide you with step by step instructions or you can click here. This makes saving login and password information super simple. There are several good applications that help with this process, but the one I use is Roboform. This software will install an extention on your preferred Internet browser that allows you to fill password and login information to your favorite sites with one click. It can also generate super secure passwords for you that you can copy and paste. Two birds with one stone. This simple process seriously saves me a ton of time and the headache of having to remember lots of different password/login information. I hope you find these upgrades useful. One or all of these tips might allow you to trade more efficiently and grow your career in 2016.